What is a Fine Grinder? The number and kind of grinding mills are as diverse as the materials they are designed to reduce. The earliest examples are as simple a mortar and pestle and have evolved to include the horse mill, windmill and watermill. Today, Stedman fine grinder products include modern air swept material handling and classification methods to efficiently produce consistent finely ground powder products. 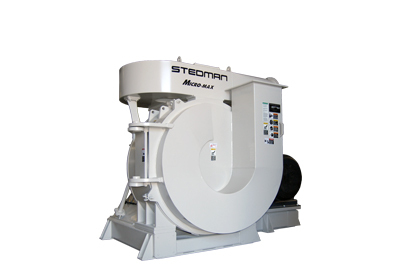 Stedman’s range of fine grinders assists in the production of materials from A-to-Z making efficient work of breaking down particles to the required or desired product gradations. The Stedman Testing & Toll Processing Facility is the place to test your material in our full size equipment to answer your specific size reduction questions. If it can be crushed, ground, pulverized or mixed, chances are we’ve done it. We have more than 10,000 test reports to help get you to the best solution quickly. To learn more about what to expect from testing, read this article that ran in POWDER BULK ENGINEERING magazine. An air swept mill for fine grinding, the Micro-Max™ is a screen-less mill capable of producing a wide range of particle sizes for diverse industries.